Central Asia is located at the heart of the Eurasian continent and has a population of some 73 m people. It comprises five republics which gained their independence following the collapse of the Soviet Union in 1991: Kazakhstan, Kyrgyzstan, Tajikistan, Turkmenistan, and Uzbekistan. Central Asia is landlocked between Russia in the North, China to its East, and Iran and Afghanistan in the South, although Kazakhstan and Turkmenistan border the Caspian Sea, which is not an open sea. Its large energy reserves and location in Eurasia has made Central Asia an important geopolitical player. Russian interests in the region are exemplified through the Eurasian Economic Union (modeled on the European Economic Community; EU, 2016) which was formed in 2000 to promote economic integration between Belarus, Kazakhstan, Russia, Kyrgyzstan, Tajikistan, and subsequently Uzbekistan (in 2006). China’s interests in the region link to the Belt and Road Initiative, a series of overland (belt) corridors and maritime (road) of shipping lanes following the ancient Silk Road that will connect China to Central and Southeast Asia en route to Europe. See Table 1 for an overview of the five countries which make up Central Asia. The five republics have been on different trajectories since gaining independence from Russia, although all depend on presidents/heads of state who assume prominent leadership roles, ostensibly to protect and maintain internal stability but in practice to preserve power and control in the hands of elite leaders (Kazakhstan, Nursultan Nazarbayev; Uzbekistan, Shavkat Mirziyoyev; Tajikistan, Emomali Rahmon; Turkmenistan, Kurbanguly Berdymukhamedov; and Kyrgyzstan Sooronbai Jeenbekov). All Central Asian countries… face the same challenges of oppressive and predatory post-Soviet states. These are deeply rooted causes of corruption, rent-seeking, state capture, administrative harassment of business and more broadly, a high degree of business uncertainty and insecurity over property rights. The situation looks particularly bad in all areas where economic management interacts with authoritarian political systems and legal institutions, especially those related to the judiciary, law enforcement agencies and public administration. That state administrative failure—dysfunctional public institutions—and poor governance go hand-in-hand is uncontroversial but is good governance conditional upon having strong state administration? Certainly, a set of strong state institutions can deliver public policy outcomes and public services beneficial to a society, but it can also be oppressive, leading to a diminution in the quality of societal governance (Dixon and Common 2011: 554). Researchers from each of the Central Asia countries offered an overview of public sector reforms during the period 1991–2000 which provides a useful baseline exercise. Baimyrzaeva (2011) offered a comprehensive overview of public sector reforms in Kyrgyzstan and describes the period as one where the administrative system experienced many formal institutional changes but practice did not improve. These changes, she argued, “had been unsystematic and mostly cosmetic” focusing largely on legal, technical, and organizational changes. In practical terms “there was a fair amount of counting outputs of reforms, such as the number of laws passed, the number of ministries that underwent functional reviews, and the number of computers allocated to government ministries…accounts of the actual outcomes were rare” Baimyrzaeva (2011: 559). This account is typical of public sector reforms in Central Asia where process trumps product. There is a preoccupation with, and abundance of, laws, strategies, directives, and speeches from the president/head of state with poor implementation capacity and limited or no attention to policy evaluation. In a case study of the agricultural sector Rural Advisory Service in Kyrgyzstan, Ritz and Voegtli (2011: 595) described the introduction of a results-based payment system. The system created targets and incentives for the advisory service to support farmers and boost their income and more generally to “initiate a shift from an input-oriented budget system to the results-oriented mandate system” – a key component of public management reforms. Amagoh (2011) examined the same period (1991–2000) in Kazakhstan through the lens of a case study in healthcare reforms outlined in the National Program of Health Care Reform and Development (2005–2010). He used the framework of public management (decentralization, competition, efficiency and quality, civil society, and partnerships) as the benchmark to track the progress of healthcare reforms under the program. Amagoh (2011:576) concluded that Kazakhstan offered evidence of meeting international standards in health care and was “addressing the various shortcomings inherited from the Soviet era. Kazakhstan has followed the global trends of public management reform and introduced a number of changes in the health sector.” While he concluded it was too early to realize the full benefits of these reforms, he was sanguine about the early results. Kassen (2018) provided an update on e-government in Kazakhstan with a very comprehensive overview of its history and evolution. He argued that e-government has been “the number one priority in advancing all administrative projects” culminating in an e-government ecosystem for many interactive and transactional public services, including open government platforms which will “change completely the nature of government-citizens interactions.” He concludes that Kazakhstan is now being considered as “one of the first of the pioneers in introducing digital government technologies in the developing world” and e-government offers the prospect of transparent government in a society rarely exposed to the core principles of public administration. Aminova and Jegers (2011: 580) examined the progress of public sector reforms in Uzbekistan during the same period, arguing that importing market-based recipes from Western societies proved inappropriate. Instead they highlighted the presence of informal structures, sociocultural mechanisms, and cultural artifacts which “filled the emerging vacuum in the areas where formal mechanisms were weakened, non-existent, or only emerging.” These informal mechanisms and social processes were, and continue to be, important in Uzbekistan because people lack trust in government. As a result, formal and informal institutions overlap, with the latter having a significant impact on public policies. Aminova and Jegers (2011) concluded that this impact can be both constructive and destructive: they expedite decisions and are inclusive of those impacted by them; and they could result in the growth or entrenchment of vested interests which are vulnerable to corruption and lobbying, respectively. Knox (2019) provides the most recent overview of public sector reform in Central Asia and the Caucasus. He compares the reforms in three countries, Kazakhstan, Azerbaijan, and Georgia, using research evidence which suggests that the New Public Management model has had limited success in developing countries. Instead Knox proposes moving to a combination of outcomes-based accountability for public services and peer-to-peer learning as the basis for raising the quality of people’s lives through better public services. There are four themes which run through the research on public sector reform in Central Asia: government effectiveness, voice and accountability, corruption, and democracy, none of which indicate much signs of improving (materials below draw on Bertelsmann Stiftung country reports and World Bank metrics). Kazakhstan shows most progress in terms of government effectiveness partly associated with the reduction in the size of the state apparatus, but it has also an ongoing program of civil service reforms. It has overhauled its recruitment and selection process, but these continue to be influenced by political involvement and nepotism. There is a plethora of strategies, presidential speeches and directives, but poor evidence of implementation. Often in Central Asia, reforms are structural, reshuffling ministries, functional reviews, and mergers. These give the appearance of reform activity but rarely result in better quality public services. Kyrgyzstan is an example writ large of constant restructuring, including the replacement of the prime minister and a number of cabinet ministers resulting in a policy implementation deficit. Over a 10-year period, Kyrgyzstan has shifted little on the metrics of government effectiveness (see Fig. 1). It has a large public administration system, but officials are poorly paid and lack competence and motivation. Tajikistan receives funding from foreign donors to assist in public policy reforms through study visits abroad and a reliance on their advice to improve government effectiveness. This appears to have limited impact (see Fig. 1) not least because the governance system is highly centralized and appointments are politically motivated. Turkmenistan is a closed country which eschews liberal democratic values and is repressive in many aspects of life. It ranks lowest in terms of government effectiveness in the five Central Asian countries. This is partly due to the fact that capacity levels are low in the civil service and decision-making vested almost entirely in the hands of the president. This results in poor coordination of public policies which are at the whim of the president and a reluctance on the part of officials to take decisions for fear of retribution. Uzbekistan has witnessed a significant improvement in government effectiveness, in part as a result of the election of President Mirziyoyev in 2017. He appears to support greater engagement with the public to improve administrative reforms in decentralization and modernization of state management. Whether these processes result in a long-term trend in improving government effectiveness remains to be seen. Voice and accountability, not surprisingly, in authoritarian states is limited. Kazakhstan is working extensively with the OECD to improve this facet of governance, but, to date, changes are largely tokenistic and part of a wider agenda for Kazakhstan to become one of the top 30 developed countries by 2050. Its chairmanship of the OSCE in 2009 could have acted as a mechanism for improving voice and accountability, but the mass media remains largely in the purview of the state, and social media can be restricted or closed down for periods of time. Kyrgyzstan, because of the experience of two “color revolutions,” might suggest a greater role for voice and accountability, but there is a certain amount of confrontational fatigue among its citizens and a realization that conflict has not served the country well. So, although Kyrgyzstan appears to be more outward facing, this has not always translated into open government and tends to be personality dependent among heads of government who change repeatedly. There is therefore no consistency in this approach even though Kyrgyzstan has the highest ranking for voice and accountability in the Central Asian states by a significant margin. Tajikistan has a weak civil society offering no alternative voice to government, and those groups which receive foreign support are distrusted as having a Western agenda. Journalists face libel and defamation charges should they report on corruption cases involving officials. Turkmenistan has a loyal and patriotic population with an underdeveloped civil society but one which is tribalized and where the president exercises repressive powers in the face of any dissent or an alternative voice. Trophy projects at the behest of the president such as a large national tourism zone in Avaza and an Olympic Village to host the Fifth Asian Games meet with limited protest from the public. 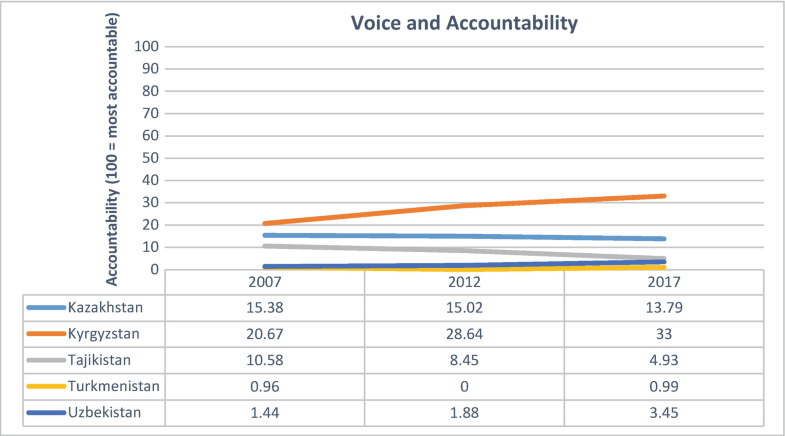 Turkmenistan ranks the lowest on the metric of voice and accountability by a long way in Central Asia (see Fig. 2). Uzbekistan under the new president appears as to be making some efforts to engage with the public. In 2017, for example, President Mirziyoyev declared 2017 the Year of Dialogue with People and Human Interests where he attempted to bridge the gap between state officials and the public. The extent to which this will make a difference remains to be seen, but there has been a small increase in the metric for voice and accountability in Uzbekistan. 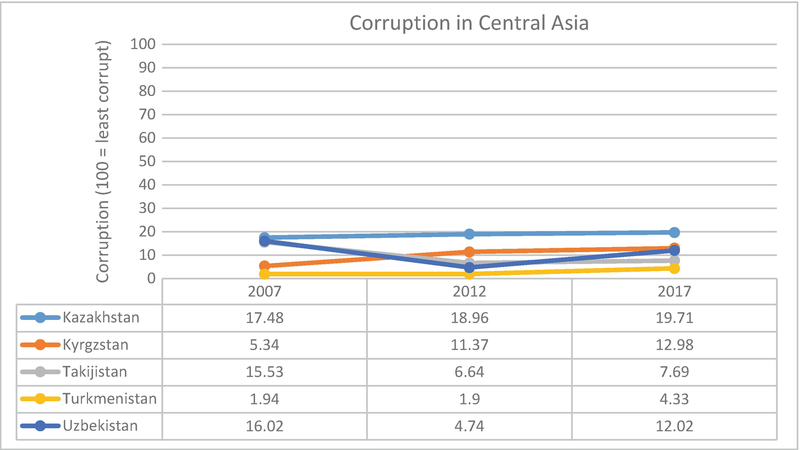 Once again Kazakhstan is doing better in terms of tackling corruption than other Central Asia states, although still relatively modest. In 10 years it has improved its performance from 17.48 (out of 100) to 19.71. This is hardly a significant achievement but the best in Central Asia. Kazakhstan has adopted several anti-corruption strategies, but still high-profile scandals dominate in projects like Expo 2017 and pensions reform. The Agency on Fighting Economic and Corruption Crimes also known as the Financial Police have shown few results, although they publicize their successes widely. Kyrgyzstan is dogged by public sector corruption. The current president claimed tackling corruption to be one of his top priorities but with limited impact on the problem. Those anti-corruption measures put in place have not been implemented and/or have limited substance. The public procurement process involves government-run tender auctions that are prone to political influence and manipulation. This is an area which is particularly vulnerable to corruption. Tajikistan appears to be getting worse in terms of corruption and has no anti-corruption strategies in place to tackle the problem. The task of addressing corruption is vested in several government ministries and agencies and hence lacks coordination and can be scapegoated. Turkmenistan, once again, has the inglorious reputation of being the worst state in Central Asia for corrupt practices by a significant margin (see Fig. 3). Although it adopted the first anti-corruption law in 2014, the problem is rife in the state sector, in particular the judiciary, security, education, and health sectors. There was a public purge of high-ranking officials on corruption charges between 2014 and 2016, but little has changed, and the media do not have access to information on cases of corruption. Uzbekistan adopted a Law on Combatting Corruption in 2016, the first law the new president signed on coming to power. The metrics show that there has been an improvement in performance in tackling corruption in Uzbekistan, but it is too early to judge if this represents a consistent trend. Are there any signs of Central Asia moving from authoritarianism to democracy through public sector reforms? Kyrgyzstan offers the best prospect given its willingness to be open to dialogue between people and the state and attempting to embrace the principles of open government. President Nazarbayev of Kazakhstan retains a firm grip on power and the organs of the state. In Tajikistan the president extended family controls over many of the high-profile appointments. Turkmenistan is essentially anti-democratic in character with no signs whatsoever of a commitment to liberal democracy. Again Turkmenistan scores lowest in Central Asia on the democracy index, and Uzbekistan is only marginally better. 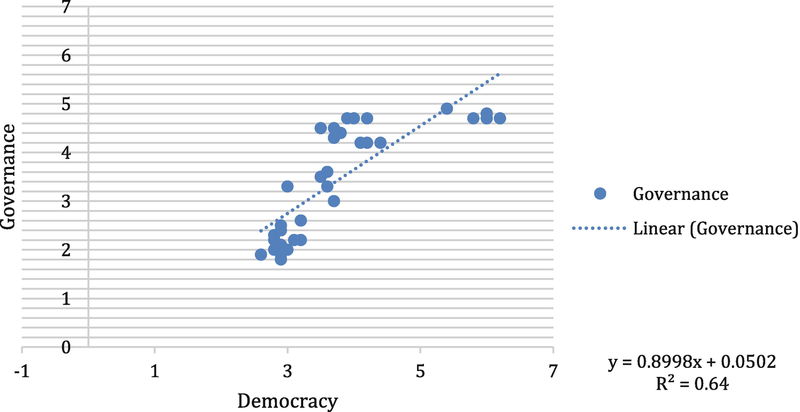 Plotting governance scores from the Bertelsmann Transformation Index against democracy for Central Asia countries over a 12-year period (2006–2018) show a strong correlation between democracy and good governance (R2 = 0.64, see Fig. 4). It is doubtful if this evidence would feature in the minds of authoritarian leaders. Central Asia is a mixed bag of public sector reforms with Kazakhstan as the regional leader and Turkmenistan the worse in a number of areas. The former is more open to innovation around digital government but reluctant to countenance digital democracy and open government. The latter is repressive and essentially anti-democratic. Kyrgyzstan, on the back of colored revolutions, sees a role for actively working with the public and has benefitted from collaborating with external funding organizations. 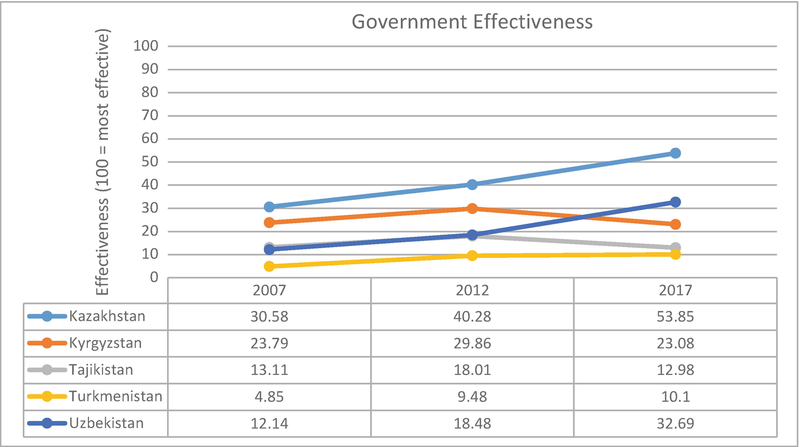 Tajikistan shows significant fluctuations in government effectiveness, marginally better than Turkmenistan. Uzbekistan is a work in progress, and the new regime has yet to make significant medium-term gains. Where there has been some evidence of Western influence, it has been in the area of public management, specifically decentralization and optimization of public services; privatization, outsourcing, and public-private partnerships; limited anti-corruption measures; and greater transparency through one-stop shops and electronic government. The situation remains however that Central Asia, comprising five authoritarian states with monopoly powers in the hands of the president and elite groupings, is likely to continue, in part as a legacy of the Soviet Union. There is little evidence that this will change in the short term and, as a result, the potential for significant public sector reforms drawing on Western models remains limited.